I bought this book (Funnybones by Allan Ahlberg and Andre Amstutz) a few years ago but my daughter never really got into it however her little brother thinks it is great. And since her brother enjoys it my daughter has given it a second try and this time seems to be appreciating the humour more (she often battles to understand when someone or a book is joking/ teasing – but we are working on it and she is getting better at reading the signs). She really liked the fact that the skeletons found the human baby scary – her response was they are more scared of us then we are of them (it is a NOT a scary book at all). Anyway since my youngest has been enjoying the skeletons I thought we could include some activities. I printed off the funnybones playdough mats from Twinkl (Platinum) and the kids had a go at them both using their play dough and their white board marker pens. I loved the kids trying to copy the skeleton drawings. We also had a go at colouring the skeleton bags from Baker Ross. (My daughter thinks they are perfect as pretend shopping bags for her toys). And my youngest had another go at some of the Dotty sticker art pages. We have done the insect version of these pages before and my youngest really liked them in fact at the time he commented that the dots were shaped like the animal skeletons. 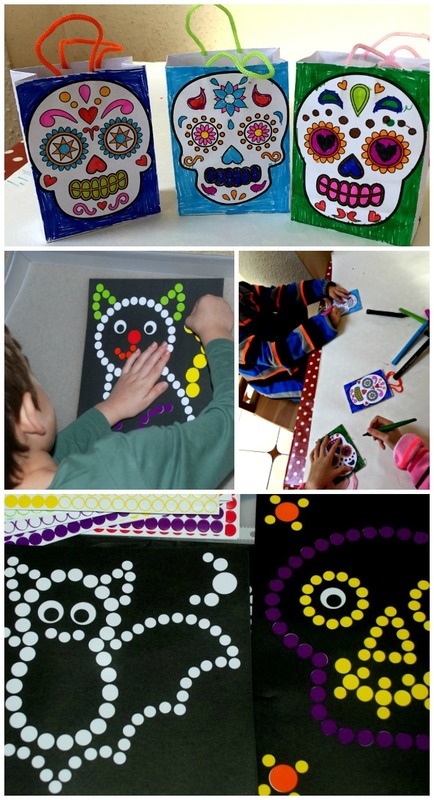 This time we tried out the Halloween themed dotty sticker art pages. I have mentioned before how much I like these dotty sticker art pages. My youngest really concentrates and tries very hard to get the stickers on the dots. They are a great winding down activity for him and there is no mess (which when you have just spent the afternoon baking with the kids and there is flour everywhere can be a HUGE bonus). This entry was posted in Book Ideas and tagged children's book, children's craft, home education, homeschooling, play dough mats, Twinkl. Bookmark the permalink. The authors today find subject matter were no one has gone before. Well done to all the creative people in the world.